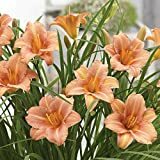 Daylily for sale is available in bare root form which is divided from a mother plant. 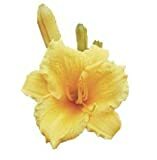 If you buy a daylily for sale, it is possible to store it out of the ground for up to two weeks. 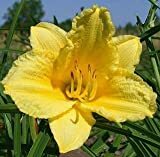 Although daylily flowers last only one day, 200 to 400 blooms can be produced by a mature clump over the course of a month or more. Caring for daylilies is easy and these are hardy plants and can thrive best if planted in early spring or early fall. Location – They grow best in full sun but will tolerate light shade. A minimum of 6 hours of direct sun exposure is needed for optimal blooming. Morning sun is best particularly in warmer areas where the afternoon sun is too hot and can scorch the leaves. 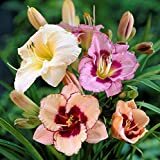 Do not plant daylilies near trees and shrubs that are likely to compete for nutrients and moisture. 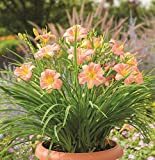 Soil – Although daylilies can grow in a variety of soil conditions, they do best in a slightly acidic, moist soil that is high in organic matter and well drained. If your soil is heavy or sandy, amend it with plenty of organic matter. Planting – If buying daylilies by mail, plant them within a few days of receiving them. Cut the foliage back to 6 inches before planting. Dig a hole that is twice as wide and deep as the root spread. Place your daylily so that the crown is about 1 inch below ground level. Space plants 12 to 18 inches apart. Water and Mulch – Daylilies needed to be watered well for a few weeks until the roots are established. One inch of water weekly is ideal, more frequent watering may be necessary on sandy soils. Mulch with bark or straw to conserve moisture and prevent weeds from growing. Young plants should be kept free from weeds and well watered for the first year. Once established, your daylily can tolerate drought. Pruning – Daylilies perform best if you remove the seed pods. Leaving these on the plant will retard the blooms of the following year. Remove dead leaves from the surrounding ground and pull out weeds in early spring. To encourage increased flowering, deadhead to remove spent blossoms that don’t drop off on their own. Cut off the stems at ground level when blooming stops, taking care not to damage the crown. Dividing – Your daylily clump will usually become crowded after 3 to 4 years and flowering will diminish. Because of this, you should routinely divide daylilies in the early spring. Use a sharp knife to separate healthy young plants with strong root systems. Divisions should have two to three stems or fans of leaves with all roots attached. Cut the foliage and replant them immediately in a rich soil. Discard any small or diseased plants.